In the chaos of the aftermath of our last production, this blog post comes a bit late. It’s hard to believe it’s all over but the cast party, frankly! This season has been so incredibly busy, that although the work on stage is over, there are a hundred administrative details to wrap up. Last weekend, we held our final production of the season, Princesses Aplenty. We performed four times, with a total of approximately 900 people seeing the show. There were 50 actors in the play – our stage and dressing rooms were packed, and in fact, we spilled out into the audience with our Juniors, seating them in the front rows to join the rest on stage when their turns came up. I can’t even tell you how many positive comments we received about the show. People loved the story, the songs, the dancing, our live band. They thought the improv scene with Sleeping Beauty and her unexpected hero was a lot of fun, they loved the strong independence displayed by our princesses. Our beautiful dragon was a big hit, our Minstrels kept them laughing, and we had so many opportunities to showcase the talent that each and every member of the cast brought to the table this year. Princesses Aplenty was a labour of love from the moment we started cooking up the story in the winter of 2011. Expanding it for the full cast was absolutely the right call for us, and we couldn’t have been more pleased with the result. There was a PARTICULARLY noteworthy element to this production – our opening night held a special surprise which we’d been keeping secret for months. Sabin Visan, long-time production crew member, met Katina Vido, five years ago during Riverfront’s first production of Princesses Aplenty. He asked permission to propose to Katina during this production, and we worked an excuse for him to do it on stage right into the show. It was a beautiful moment for us to be part of, and very special for not only our very dear couple, but for everyone who got to see it. If you’d like to actually SEE the proposal (OF COURSE YOU WANT TO SEE IT) – then have a look right here. 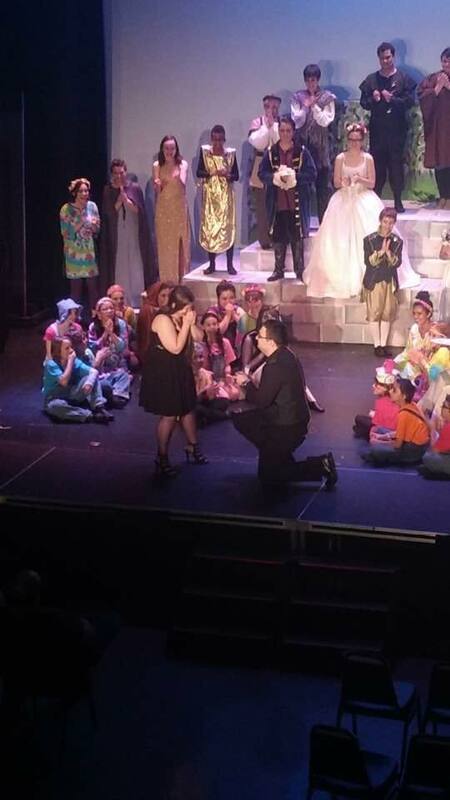 I hope to produce Princesses Aplenty at least once more with Riverfront before I retire; it is, without fail, the show the kids request the most. Anyone who joined us this season to see it will, I hope, agree – it’s pretty special. Again, our thanks to everyone who made this season possible and successful. We’re already hard at work getting ready for the coming season, and the number of students returning tells me that I’m not likely to get to more than a couple of students on the Seniors waiting list. I might do a bit better with the Juniors, because we have a lot of kids moving up this year, which creates openings. I hope everyone has a safe and happy summer – we’ll let you know about our annual Car Wash and Smash fundraiser coming up in July! Previous: Previous post: Book Your Classes For Princesses Aplenty! Next: Next post: Our Stratford Trip is Upon Us! And the Next Season is Already a Hot Topic with the Kids!